Making industry waves with their specialized Yakima Sportsman and Heavy Duty Truck collections. Both built for functionality, versatility, and to our new standard for off-road ratings. Fish on. With a whopping 150lb capacity, this is the first universal kayak saddle strong enough to handle heavy fishing kayaks and sit-on-tops. 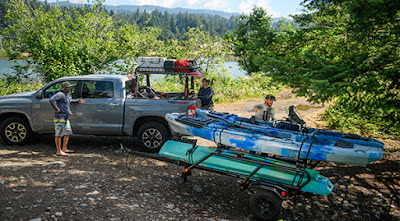 EasyRider utility trailer hauls big fishing kayaks and rec boats up top with room for coolers and gear underneath. 500lb carrying capacity—load it up. Built for hard work and rugged play, the OverHaul HD adjustable truck rack delivers best-in-class strength and outstanding versatility.